Last week, Louisville cut the ribbon on the $2.6 billion “Ohio River Bridges Project” — a highway expansion that includes a gargantuan new interchange between downtown and the riverfront, known as Spaghetti Junction. It’s all the more upsetting when you consider what might have been. A grassroots proposal to tear down a portion of the old highway and replace it with a park garnered considerable support, but was ultimately dismissed by local elected officials. Here’s a rendering of the park and esplanade that the teardown would have made possible. An alternative to the “Spaghetti Junction” would have offered Louisville residents direct access to this park. Louisville threw all that away to shave a few minutes off long-distance car commutes. 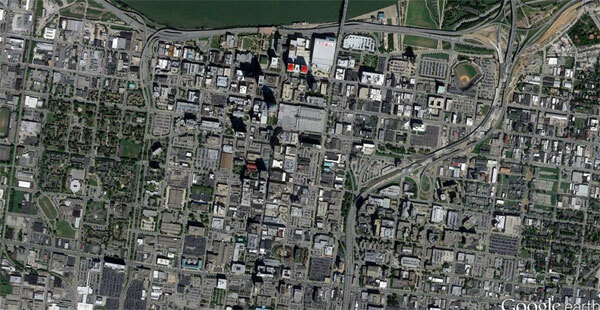 And here is Louisville with its present complement of highways and parking lots. It’s a tragedy that this is still happening to cities. Other good reads today: Urban Review STL says that rather than pouring millions of dollars into a soccer stadium, St. Louis would be better off using the money to clear the way for development at the site of a decommissioned highway. And Bike Portland reports that outgoing mayor Charlie Hales used his final public remarks to criticize Oregon DOT and car culture. In addition, the project included the cost of building the new Abraham Lincoln Bridge and repairing the existing JFK Bridge. Now upon completion, the two bridges combine as Interstate 65, now a 12(!) lane monstrosity across the Ohio River feeding into Downtown. And some people complain that bike projects are too expensive… Rather than pay for one highway interchange, $1,100,000,000 could probably build out a safe bikeway network in one or two dozen cities. Louisville rocks. The highway system has its low points. But all in all it blends in better than the photo would suggest. Also, since the project is just now being completed, everything looks stripped and bare in that area. I reality that is not the case. The connection to the river is not impeded by highway 64 since it is elevated above. Besides, Forecastle and other events use some of the overpass for shade and shelter during huge events. Wow that’s heinous. They could’ve done a lot of good with that 2.6 billion dollars. Instead they got this. Does this project make it impossible to remove the waterfront highway? Central Park is 843 acres. The 33 acres of “forest” that were supposedly consumed are about 4% as large as Central Park, not twice as large as is stated here. Having driven through this interchange a million times, I don’t know where those 33 acres are supposed to have come from. I don’t recall there ever being anything even close to approaching forest anywhere near here. The look of this interchange is roughly the same as what’s existed there since the ’60s, and it doesn’t seem to take up any more space. As is mentioned above, I’64 is elevated. Park land has existed both above and below the highway since the late ’80s/ early ’90s. 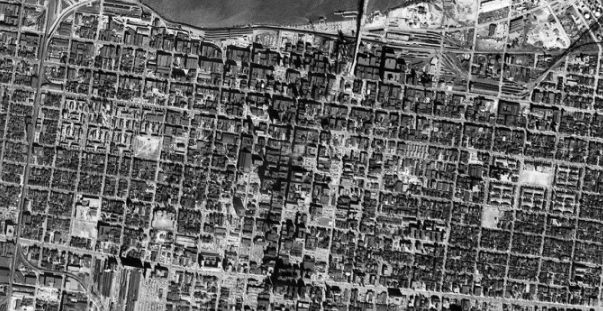 Before that, most of this land was railroad yards and scrap yards. The dominant neighborhood feature when I was a kid were giant piles of scrap metal. So while this may represent a lost opportunity and a big waste of money, the area isn’t nearly as blighted as this piece wants to imply. It’s actually a pretty nice place to walk. The reference is to Louisville’s Central Park, which is 17 acres, not the Central Park in Manhattan. I would also like to point out some errors. The 8664 plan would have kept the majority of Spaghetti Junction (https://www.flickr.com/photos/80464769@N00/3041784630/). The alternative view this article uses shows a section of Louisville that wasn’t even involved in this project. The 8864 plan called for removing the interstate west of I-65. All of spaghetti junction is east of I-65. The $2.6 billion price tag includes the building of the Lewis & Clark Bridge (a key component of the 8664 proposal), the building of the Abraham Lincoln Bridge, and a complete overhaul of the Kennedy Bridge (which was much needed to improve the safety of all travellers). Over the past two years, Louisville’s bike network has increased by over 40 miles of dedicated lanes. (http://www.wdrb.com/story/25644060/40-new-miles-of-bike-lanes-to-be-put-in-louisville) Not to mention the opening of the Big Four Bridge, a pedestrian and cycle bridge crossing the Ohio River. Or the new bike and pedestrian facilities on the Lewis & Clark Bridge. 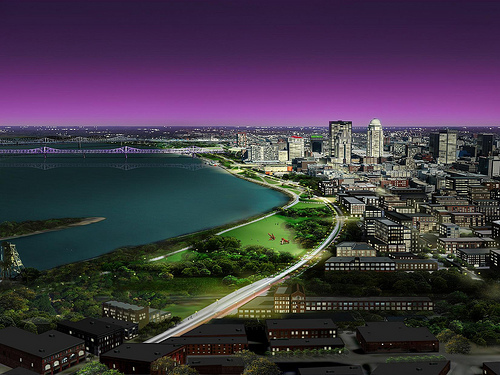 As a Kentuckian, this project is great and has greatly enhanced the city. This article grossly mischaracterizes the city and it’s ability to propel her people forward. I think the complaint is that 2.6 billion dollars were used to support a project that benefits motorists and motorists only. You are right. It is the nicest monument to death and health problems ever erected. Propel her people forward? That is beyond simplistic can you articulate the benefit of this a little deeper? It’s never *impossible* to remove something, but having just spent gazillions of dollars on refreshing it, it makes it unlikely. And if it is removed, the gazillions of dollars will have been wasted so officials won’t want to remove it. Massive spaghetti junctions are an intentional waste of money. The highway planners, like NASA, have learned that the more money they spend, the more money they’re given, so they plan out insanely complex interchanges that actually cause traffic jams, to waste as much as possible. Such an interchange costs far more than a conventional cloverleaf or three. They do pretend it somehow helps traffic flow, but such interchanges in real life are among the most congested strips of highway in the country. Atlanta’s spaghetti junction is one of the largest, and THE most congested. They waste the money on purpose, as government bureaucrats generally do. It allows them to come crying to their sources of funding, claiming they need more. Watch every budget hearing ever on C-SPAN and you’ll see what I mean. Government bureaucracy is rewarded for waste and failure, punished for efficiency and success. Per user, bike paths are an absurd waste of money. They are cheaper, but facilitate FAR fewer commuter miles per dollar. They are, in that regard, so overpriced that in order to have enough cyclists using them to commute that they pay for themselves, they’d have to be more congested than a highway rush hour. They are cheaper, but facilitate FAR fewer commuter miles per dollar. Cycling trips are shorter, on average, than driving trips, so comparing mileages is misleading at best or dishonest at worst. If that bike lane weren’t there, how many cyclists would drive instead? At what point would they cause enough roadway congestion that there’d be pressure to add another lane for cars, which as you say is far more expensive (if even feasible, given space constraints)? Those additional drivers would also need parking, would cause just a bit more damage to the environment, and would increase the safety risks, especially to pedestrians and to cyclists who remain. And, without that bike lane, how many more people would find it necessary to buy a car? Some of those are poor people who can’t afford the expenses associated with a car; others may be able to afford one but would simply have less disposable income as a consequence, resulting in a lower quality of life overall. Perhaps a bike lane isn’t so bad after all. In the US where few cities or towns have built out a safe cohesive bike network, most bike paths are underutilized. Cities like Portland and Davis CA are some of the few examples that have a decent network and they get higher usage. If we spent literally a fraction of what was spent on one interchange for a bike network throughout an entire city, you would see great returns. Instead we slowly piecemeal improvements and wonder why more people aren’t using bikes. If you want to talk about an absurd waste of money, it’s spending over a BILLION on one interchange. I mean per mile of cycle path, or even per dollar spent on cycle paths versus highways. A given dollar of cycle path is utilized by a fraction of the number of individuals per day, versus of highways. It’s a small number of people, few of whom are using it out of any kind of necessity at all, and all of whom could be riding on roads, instead. It’s purely wasted taxpayer dollars, and at a much higher expense per user. > If that bike lane weren’t there, how many cyclists would drive instead? Few, since they’re generally being used for something other than necessary commuting. Few are using it to go to work, zero are using it to go grocery shopping. Those who are can generally ride a bike on regular roads, instead. But what if some do drive? That’s no loss. As I said, the price per user is exorbitant, because the number using it is microscopic as a percentage. They are so few that they’d be a tiny blip.